What the heck is a Schuba? Who is Schuba? Do I eat it? Talk to it? Play it? I should probably backtrack. Many of you know that I am heavily involved in a start-up church (don't confuse with company) called The Line. It all began back in September for me. I moved to the city of Chicago (don't confuse with Chicagoland) down in January as Aaron, the lead planter, his wife, Kayla, and their three children moved to here from Seattle. There was only a handful of us at first, meeting regularly at their apartment in Lincoln Park. Needless to say, nothing is conventional. There are no "12 Steps for a Church Plant" that ensures success (if there are, shoot them immediately--the gimmicks, not the people). We have tried our hand at a bunch of different things as we seek to know Jesus more, the city more, and how we might see the city to know Jesus more. I am completely out of my comfort zone on so many fronts, but it cause me and the rest of us in the church to depend on God and trust that His Spirit is moving. One verse that really struck me as we were starting up is in Acts when God tells Paul not to give up on his mission. We have done informationals, strategy session after strategy session, city learning times, doctrine studies, celebration nights, and regular old fashion church services. We are still a plant. We are still small. We are still seeking the Lord, believing that His people are here and we must continue to speak, preach, teach, and live out the gospel of Jesus Christ. So what about Schuba's? How does that fit in? Well seeing as how nothing is conventional, one of the most challenging things for a beginning church in the city--and nearly any church for that matter--is meeting space. Congregating in the pastor's home is good for only so long. The intimacy can quickly turn into BO. In other words, we can wear out our welcome, wear out the family, and cease to grow, stinking the place up rather than emitting the sweet fragrance of God. The other challenge for a beginning church is having enough of the green paper. It's barely coming from the inside and people on the outside aren't usually directly involved enough to stay committed in the long run. The flow can run low. So in the city, where borrowing seems to always come with a fee, even if it's your neighbor's sugar, we are faced with the challenge of finding a building that holds a church of 30 (on good days). We thought we had a solution when we landed a small room at a church in one of the neighborhoods near by. We held a big event at the Congress Theater on the 26th, and when I say big, I mean we topped three digits in a space that could fill 4000. I assumed that the event would get some new faces at the church we had been gathering in. However, in the middle of the week we lost the church due to circumstances I am not aware of and we had no place to meet for this past Sunday. 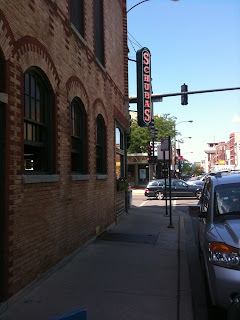 Enter Schubas. 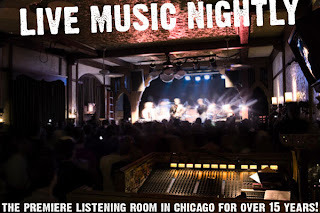 Schubas is a bar/restaurant/music venue that has hosted the likes of Sufjan Stevens, the Fleet Foxes, and Andrew Bird. I don't know how Aaron did it, but we got an e-mail on Wednesday saying that it looks like we will be meeting here. The amazing thing is we got such an amazing deal, it is the perfect size, and the people that work there are extremely kind to us! Aaron arrived at 8:00 am on Sunday morning to see if things could be ready by the 11:00 am service, and everything was set up already! We have a sound guy who really wants to work that slot every Sunday and I think we will be blessing them with beautiful music by Milano (members of our church who make up the band for a program I will write about int he future) along with solid preaching by Aaron. I arrived on Sunday, and was utterly blown away. In so many ways this place is perfect for us in where we are at as a plant. In fact, a couple came to the church this weekend after the girl had flown in from Florida bummed she couldn't go to church. She and her boyfriend were outside getting ready to eat breakfast at the restaurant when they found out we were having a service in the music room! This is a God thing. I am extremely pumped about the location and where we are at as a plant. People are moving to the city. The gospel is being shared. People are coming to Jesus. God surely does have many of his people here.